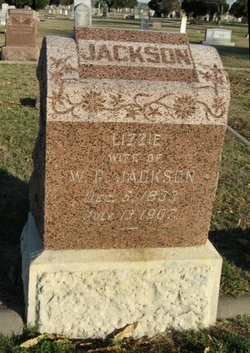 Mary Elizabeth “Lizzie” McCoy Jackson was my maternal 2nd great grandmother. Mary Elizabeth McCoy was born on 05 Dec 1863 in Indiana, as the first child of William Henry McCoy and Matilda Carter. She had one sibling, Alma. She died on 13 Jul 1907 in Winfield, Cowley, Kansas. When she was 17, she married Walter Perry Jackson, son of George Washington Jackson and Nancy Ann Carson, in Apr 1882 in Ottawa, Franklin, Kansas. Olive Jackson was born on 18 Jan 1884 in Lane Franklin, KS. She died on 14 Dec 1966 in Missouri. She married John Frederick Harkins on 22 Oct 1904 in Newkirk, OK.
Besse J. Jackson was born on 09 Apr 1885 in Kay, Oklahoma. She died on 28 Dec 1966 in Las Vegas, San Miguel, New Mexico. She married Ralph Stewart on 19 Dec 1906 in Santa Fe, New Mexico. Arville Jackson was born on 05 Jun 1886. He died in Oct 1975 in Oklahoma. He married Anna Kahoe in 1916 in Severy, Greenwood, Kansas. Noland Clair Jackson was born on 26 Aug 1905. He died on 05 Jul 1985 in Wichita, Kansas, USA. He married Audra Denton on 13 Mar 1929 in Kansas.